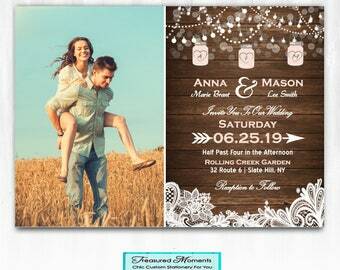 Wood and Lace Bridal Shower Invitation with Mason Jars. This listing is for a print ready, high resolution DIGITAL FILE ONLY of this Wood and Lace Bridal Shower Invitation (JPG or PDF). 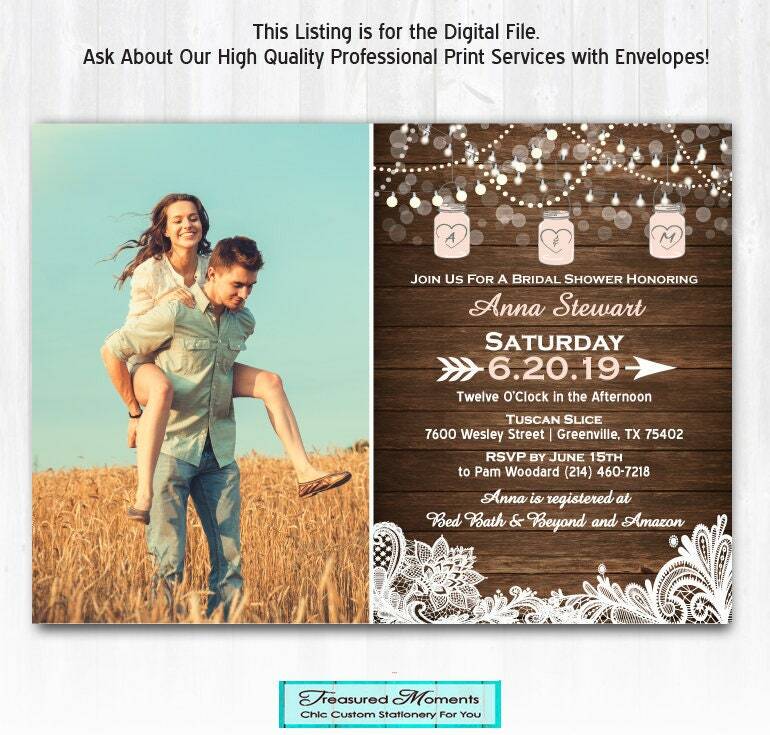 This Invitation will be personalized with your choice of wording and emailed to you for you to print at the printer of your choice. All of my Stationery is customized for you with your custom text and photo/s (if design includes photos). All invitations can be customized to be used for any celebration, like Wedding, Bridal Shower, Engagement Party, Birthday Party etc. I have coordinating pieces for each of my designs including: Recipe Cards, Enclosure Cards, Bridal Shower Games, Favor Tags, Table Signs, Thank You's, etc. Please contact me for more information & pricing on coordinating pieces. 3. Email to 'TreasuredMomentsCard@gmail.com' a 300 dpi, high resolution photo/s (if design includes photos). If this design includes photo/s, submit your photos in .jpg format. Photos with a resolution of 300 dpi will produce the best results. I am not able to guarantee the print quality of a low-resolution photo.